A two year old toddler has barely escaped death after falling out of his grandfather’s van at a busy Chinese intersection. The child was saved by one of the car’s passengers, the driver of which managed to capture the frightening experience on his dash cam. 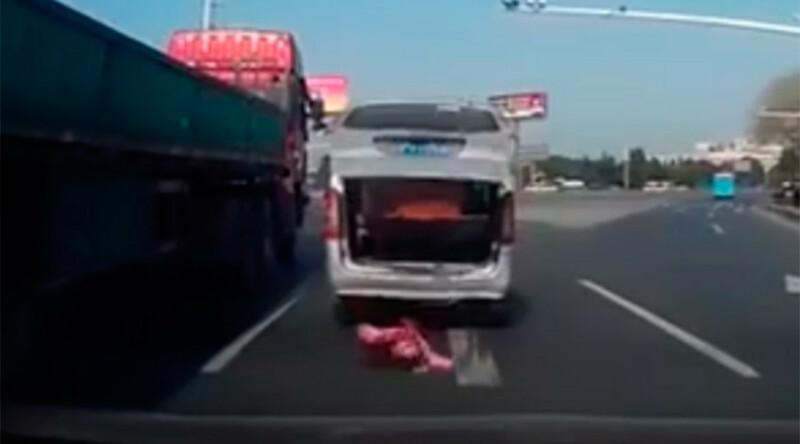 The incident near Wujiang, Jiangsu province, China happened when a white van stopped at a traffic light and its trunk door suddenly opened. The vehicle moved again, and out of nowhere a two-year-old kid tumbled out of the vehicle onto the road. Apparently uninjured from the fall, the kid was left standing on a busy road, as his ride hit the gas and left the scene of the bizarre incident. The toddler was then left to wander around in busy traffic. 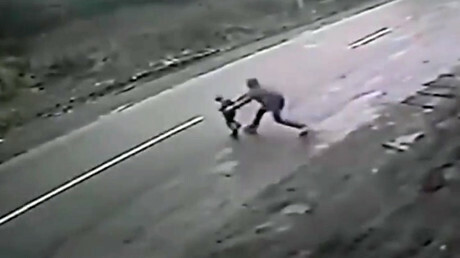 The passenger in a different car which captured the footage of the entire ordeal got out to save the kid, before the child’s grandfather, Yang Defu, returned to the scene having realized that he had been missing the precious cargo. Yang told local press that the child had fallen out because the trunk of his van suffered back door damage from an earlier collision during Chinese New Year celebrations last month, which resulted in the back door sometimes randomly flying open on its own. He said that his grandson just happened to climb over the back seat before falling out onto the road. “I was waiting at the red light. After passing the intersection, a car chased after me and kept sounding the horn. The driver told me a kid fell out of my van. I looked back, parked my van aside, and went back to search for my grandson,” said Yang. Local media reports sai that that the kid had been saved by a warehouse manager, Du Xiuli, who since the February 27 incident has been awarded an honor in a ceremony.